Zelda’s mother instincts became the key to yet another episode of The Magicians in “The Serpent,” triggering a series of self-discoveries and proving once again that actress Mageina Tovah has the chops to humanize the most powerful (and evil?) institution in the multiverse. As she re-evaluated her position within the magical world thanks to her daughter Harriet, so too did many other characters go on their own introspective journey. 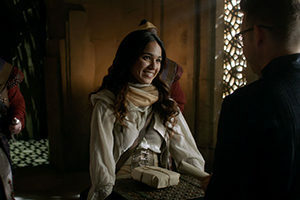 Alice (Olivia Taylor Dudley) literally faced herself in the Mirror World, Margo (Summer Bishil) chose love over duty, and Penny (Arjun Gupta) made a shocking discovery that could change the course of the season. A tale of two Alices. The hour full of revelations opened with the biggest misdirect of all: a terrorist group of supposedly errant Hedge Witches, appropriately named The Serpent, were infecting fellow witches with earworms to prevent them from using magic. Sounds a little strange, considering the Hedge Witch agenda has always been to get more magic not less. But thankfully The Library has the perfect cure, courtesy of leader Everett: The Reid’s Mark, which nullifies a witch’s magic and thus stops the worm from killing them. Convinced that this was the wrong path, Kady (Jade Tailor) enlisted Alice’s help – after punching her in the face as payback for the whole Library debacle. Together, the girls brought Zelda on board in exchange for rescuing Harriet from the Mirror World. The issue? Harriet was split into various pieces which required Alice to put her back together. In the process, Alice also pulled out a second fragment of herself – the more callous, dangerously confident side that she was so ashamed of. As much as Alice would have liked to leave her trapped, Harriet made it clear she needed to be whole once more. And so Alice trekked into the Mirror World and engaged in some serious self-reflection with her self’s reflection, trading insults and passing blame until the two girls decided it would be better to live together than die apart. 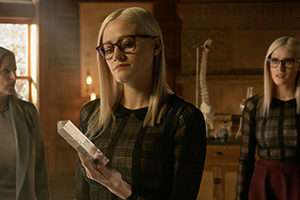 “The Serpent” didn’t clarify which Alice was truly responsible for putting the Library in charge, but The Magicians has always been more about feelings than facts. Speaking of, Zelda bonded with Kady over the empathy she felt towards a fellow hedge witch – even acknowledging her as the right choice to lead the others against the Library. It’s a fight that Zelda herself may even partake in, because the first thing Harriet did when she was out was inform her mother than Everett was the real Serpent. Margo has found a new lease on (Eliot’s) life. That revelation may have been a little clunky and abrupt, considering we didn’t care about Everett before this episode, but it set the tone for a night of reversed expectations. Similarly, the Fillory plot commenced with Fen (Brittany Curran) trying to avoid her destiny of dethroning Margo while Josh (Trevor Einhorn) planned a State Dinner to strengthen his part-time lover’s reign. Neither of them got exactly what they wanted, though, because Margo found a new purpose as soon as she learned Eliot was still alive. While the joy allowed her to act on her feelings for Josh (speaking of abrupt…), they also made it clear to her that she needed out of Fillory in order to save her best friend. So instead of being forced to team up with the leader of Loria to take out Margo, Fen found herself tearfully enacting Margo’s own wishes to be dethroned. Her new mission was to track down The Foremost and obtain the help necessary to cast the monster out of Eliot’s body. As for Josh? He promised to wait for her faithfully while ensuring Fen had everything she needed to run Fillory well. Finally, Penny volunteered himself to guide Not Eliot (Hale Appleman) through his mind palace in order to discover just what Enyalius and the other gods did to him in a past life. Quentin (Jason Ralph) and Julia (Stella Maeve) were naturally worried he might die, but Penny had a bigger picture in mind: if he lived, Julia would go on a date with him. I’m still not sure how I feel about this pairing as an avowed Penny and Kady shipper, but if there is one constant in the multiverse it’s how far Pennys will go for the ones they love. He helped the Monster remember how he was taken apart by the gods out of fear, and how a girl was sacrificed in order to end him, but then he got pulled into the real Eliot’s safe space for a moment. That is where Eliot revealed the terrifying truth of what the monster was planning, which we don’t get to learn until next week. Presumably, that’s also when we will find out what’s inside the binder that Alice grabbed out of the Mirror World on Julia’s behalf. The season’s all coming together, even if a few threads have more knots in them than others.